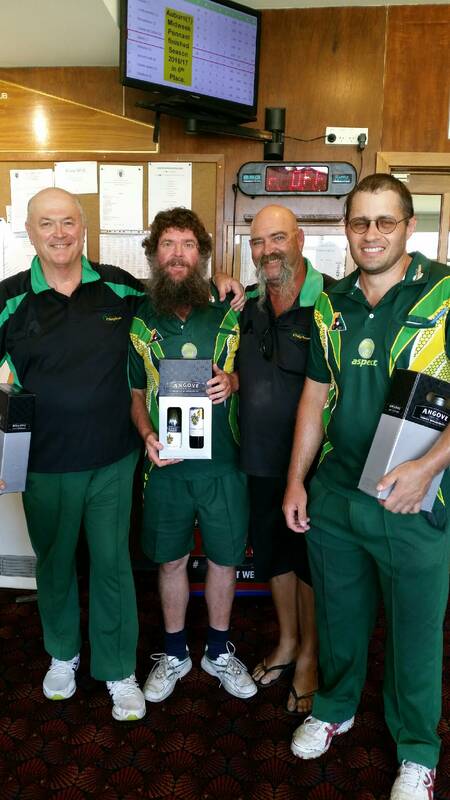 Each year Auburn bowls club hosts two tournaments, our major fours tournament, the Labour Day Fours, and a Triples tournament, the Le Pines Triples. Over the last year the Auburn bowls club made the decision that we needed to move the triples tournament from January to the September, not only are there a lot of tournaments on in Jan, but it also gave the greenkeeper a chance to renovate the green. Our Tournaments are as always impossible without the support of our Sponsors. Winners of the Le Pines Triples for 2017. Don Clancy, Mick Diorietes, Rod Clancy. With Michael Walker the President of the Auburn Bowls Club (Center) and Sue Zidzuanius the tournament director on the right. We had players for all our usual neighbouring Clubs, Hawthorn and Richmond, as well as a couple of new faces picked up over from various contacts. The boys from Harcourt bought the bus down, as well as some gifts for the Club, of beautiful fresh fruit, many of the players were able to take home this fresh as they left. They also gave the Club a box of small goods which will be enjoyed by the members over the next couple of week. The winners were a team from Clayton who have played in this tournament for the last few years but this was their first win, congratulation to Tim Gole and his team. Second was the Law Mans crew from Richmond Union who are never far from the top of the score board. Great to have them at the club and congratulations I know they always put more money over the bar than they ever win in prize money. The best last game went to Rod Harris’ from Harcourt team. The random prize of a free entry to the Le Pine Triples went to a team from Hawthorn.